I posted a sneak peek a few weeks ago, and now here's the full reveal of my December Daily cover, made with the December kit from The Paper Bakery. 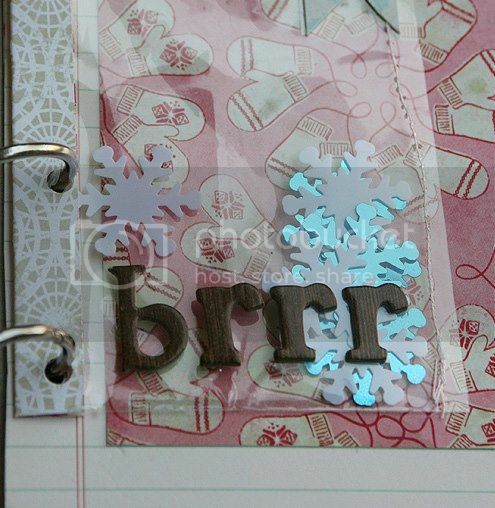 one of my favorite pages inside, a see-through page made with part of the packaging...love it! Love how u did the flag background! Wendy, please email me at picsnpages@verizon.net with your address and I'll get your prize package in the mail!! Thanks to everyone for playing along, and thanks for all the sweet comments! This is gorgeous, Mary Ann!! I hope to be able to get my album ready this weekend. I loved doing this project last year and I'm looking forward to doing it again this year. Oh! It's so pretty! I'm so ridiculously excited about doing a DD this year. Love the idea of using the package! awesome - i love the cover! Looks awesome Mary Ann!! Love the colors and the cut out title on the front!! I love the cover with that great cut out! Such a great use of the kit! !